A quick peek inside my bedroom! It's always so much fun when you see things you LOVE on a friend's blog! I went to House Mysteries today and she has made some GORGEOUS jewelry! My favorite........the Lady of Shallot necklace, of course! Here are photos of my Lady of Shallot 'dream' room. And now we've added a chair and lamps! and always wanted to decorate my bedroom around the theme. and what is it called? Camelot! Of course! to my jewelry armoire and I am SO happy with it! I realized I had a reflection of the Lady of Shallot when I took the photo! This is some metal art called "Cat Tails " that we bought at an art show last year. instead of getting everything all at once. Thanks for inspiring my post, Denise! when I saw this on A Haven for Vee ! Vee posted about the link called Penny Postcards and LOOK what I found! 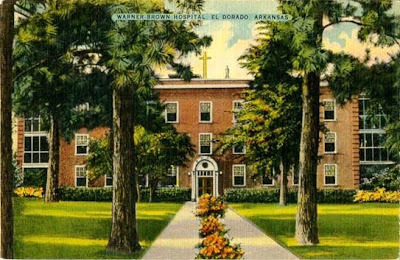 Warner Brown Hospital....the famous site of my birth! heehee! Here's the link to this page and postcards from the town where I was born! Let me know if you find anything interesting in your search! It's a cool rainy day here but I'm getting lots done! "Wednesday Wee Ones...and getting things done!" I've been off the computer for a few days to get some things done and finish some projects! I'm going to enjoy catching up on everyone's blogs! I LOVE going to all my favorite blogs! It's like opening up presents and finding something new in every one! One little project I really enjoyed making was this little Mary Engelbreit scrapbook. so I used supplies I already had and what FUN! I LOVE cutting out paper dolls anyway! Relieves STRESS! to store an extra doll and clothes! The only design flaw I have is with the lace I used on the front. I can't get it to stay on! It won't stick! I may have to put a piece of paper instead of lace. Or maybe copy some lace like Diane showed us how to do one time! It's always fun to do something different! And I LOVE paper dolls! ENJOY! And try something new! and found a bag of old buttons that were my Grandmother's. 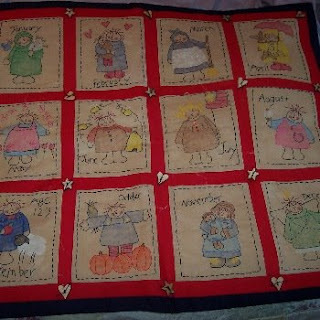 then I am sure the clothing was cut into quilt squares. and a stack of quilting, sewing and crocheting magazines on the other side of her chair. I'm so glad I have a few of her things to make into projects that I can share with others. and dressed them in cute dresses from her fabric stacks. so she had a lot of beautiful material. What a blessing to have a a few precious things to enjoy! 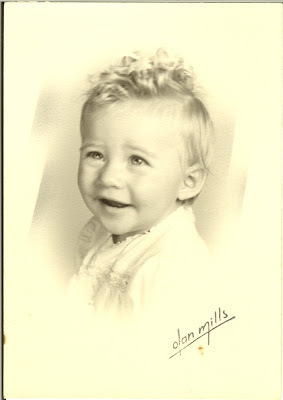 This is one of my favorite photos of my Grandmother! I looked so much like her when I was that age. 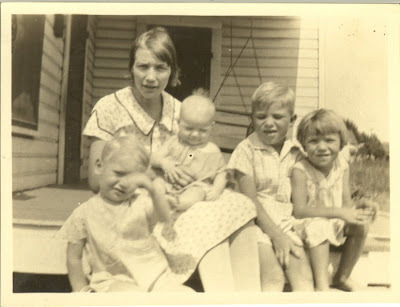 My mother is the baby in her lap! and to all my loyal followers! My hubby used the Random Generator to choose the number! with her fanciful blog ! that I can't keep up most of the time! But what a FUN time and how blessed I am with friends and family......and good food! I made this Irish Soda Bread using the recipe from Charli and Me ! I found this recipe by going to Vee's blog! (thank you, Vee!!) OH MY! and my photo definitely does not do it justice! and I think that would put me over the calorie limit for one meal! and most of the Irish Soda Bread! YUMO !!! that I won in the drawing at the Rose Hip blog! I was amazed at the detail when I received it! Thank you sweet friend for this beautiful gift of love! I hugged it when I took it from the box! I also received my beautiful bird collage from My Hiding Place this week. I won this in the One World One Heart event! It's beautiful and my photo does not capture the beauty! Won't it look pretty in my new red kitchen? And please sign up for my giveaway this week! I love my dolls but I love old children's books, too. I have a large collection of old and new Golden books that I treasure. and even some that I bought at a sale years ago from the late '40s and '50s. And of course I've acquired new ones along the way! And for MORE fun...PLEASE sign up for my drawing HERE ! This is my Lloyd Middleton doll, Winter. I made this little dress and the beret, too! And be sure to enter my giveaway! Drawing will be March 20th!!! I want to THANK YOU with a GIVEAWAY! and sharing all my creations with friends and family! I've met so many incredible people and made so many new friends! and realize how valuable each and every one of you are to me! there were out there in the 'real world' until I started looking at blogs! If you want proof of this......go down my blog list and spend some time on my favorites! And there are MANY more out there! I discover new blogs all the time! Does anyone need a 'mouse in the house'? My mice are so good for so many things! A must for your hobby room or work area! My mice are very accustomed to living in a house! But if the weather's nice they might go horse back riding. Or just stop to smell the roses! or put on an apron that you've just made! But one thing's for sure.....they get along well with others! So here are a family of mice that would love to move into YOUR home! And here's a pattern for cute apron ornaments. I will include something else for FUN! on the first day of Spring, March 20th (in the morning)! Thank you for making my life so much brighter and more FUN! I am so happy to be back and have so many neat things to share! is all the new things you get to experience. Traveling opens up so many creative avenues! I said....PULL OVER and let me take a picture of that Cowboy! Yelling like that will at least shock my hubby into slowing down a LITTLE! at the Palm Grove Club within walking distance of our house! we were amazed at the talent among our friends and neighbors! I bought 2 small prints but forgot to take a picture of one of them! EEEE! I LOVE the colors in this one and we hung it in the study. I bought some note cards and these book marks. I love pretty handmade bookmarks! I am an avid reader and they make me happy! This is one of my favorite blogs, "Hand made Annie dolls"! Her sweet dolls delight me! I also put wooden hearts and star buttons on." Wouldn't this be amazing to WIN! so I'm going to do some baking today and enjoy being inside! We went on our little trip but I only managed a few posts! No good connection to email, read comments or look at anyone's blog! It was different...that's for sure! and even did some crafting! I decided to work on a little scrapbook and it was a fun change of pace! I'll post pics soon! I haven't quite finished it! I can't wait to read my comments! and have so many friends viewing my posts! but next time come to Florida WITH me! We left and it was 25 degrees with several inches of snow on the ground! we got back last night and our high was 42 today! The mountains are in view! YAY!!! I missed you ALL! I'm going to start catching up! and see what everyone's been up to! A blog that makes a difference!